This cover is simply hilarious. It doesn’t depend on elaborate action or a tasteless tease that doesn’t even pay off in the end. The front of Fantastic Four #528 blends humor and character, all while showing audiences what to expect from the story inside. Mike McKone is a criminally underrated artist, and he shows off just why he should be considered for more high profile work with his work on Fantastic Four. Fans of the Thing know better than to believe that his temporary financial luck would last longer than a couple of issues. 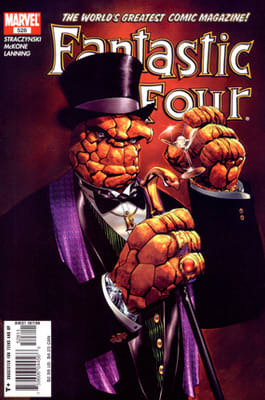 Despite that, writer Joe Michael Straczynski and McKone teamed up to deliver one of the more entertaining issues in the title’s long history.